Take a leisurely 45 minute guided tour on horseback (no galloping) or an old-fashioned wagon ride through the trails of Disney's Fort Wilderness Resort and Campground. Carriage rides are also available at Port Orleans Riverside. Trail Rides Begin at 8:30am daily. 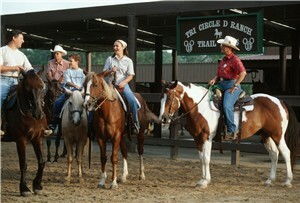 A 45-minute guided horseback tour through the campground's scenic areas. Wagon Rides leave at 7 p.m. and 9:30 p.m. nightly. Departs from and returns to Pioneer Hall. Children (ages 3-11) must be accompanied by an adult. Reservations not required – first-come first-serve basis only. At the Petting Farm located between the horse barn and Pioneer Hall. Children (ages 2-8) must weigh no more than 80 pounds. Pony Rides - $3.00 per ride. If you're planning on riding the trails, you should be aware that there is an age and weight requirement. Children under nine are not allowed to ride as well as any guest weighing over 250 lbs. Pony rides are available for children (ages 2-8) who do not meet these restrictions. Closed shoes (not sandals) and long pants are recommended when horse back riding. (407) WDW-PLAY to make a reservation. Reservations may be made up to 30 days in advance. Tickets must be picked up at least 30 minutes before departure. Guests should arrive at the Tri-Circle-D Livery at least 30 minutes in advance. 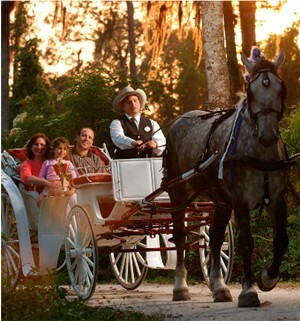 Horse Drawn Excursions are offered nightly at Disney's Fort Wilderness Resort and Campground, Saratoga Springs Resort & Spa and Port Orleans Riverside. Location: Disney's Fort Wilderness Resort and Campground. Meet in front of the Pioneer Hall area. Departs from and returns to in front of Crockett’s Tavern. Cost: $35 for 30 minutes. Tickets sold by carriage drivers. Cash and Disney Resort guest room charges accepted – credit cards cannot be accepted. Small carriage holds 2 adults and 1 small child. Larger carriage holds 4 adults or 2 adults and 3 small children. Location: Port Orleans Resort. Departs from and returns to Riverside in front of Boatwright’s Dining Hall. Take a horse-drawn carriage ride through the French Quarter and Riverside. Schedule: Starting at 6 p.m. The last ride each night departs from Boatwright's at 9:30 p.m.
For Reservation: Reservations can be made during the day at the Riverside Marina and are recommended, but not necessary. Reservations can also be made by calling407-WDW-PLAY. Carriage Style: Each carriage can accommodate up to four adults, or two adults and two or three children. The last ride each night departs at 9:30 p.m.
Tickets are available on the date of the hayrides at Fort Wilderness Kennel from 8:00 a.m. to 5:00 p.m. and are sold on a first come first come basis. Advanced tickets can be purchased starting October 10, 2007. Call 407-WDW-PLAY. Reservations can be made by calling 407-WDW-PLAY. Rides accommodate 4 adults or 2 adults with 3 children. The rides departs every 30 minutes from 5:30 - 9:30pm. Times, prices and details are subject to change without notice.